As winter rages on and temperatures still remain frigid, it is important to keep finger safety in mind. When the temperatures dip below zero, it won’t take long for frost bite to set in, especially in your very vulnerable hands. That’s why it is essential to choose winter work gloves, or insulated gloves, that can protect your hands while still allowing you to complete all of your tasks on the job. Revco Industries’ new Black Stallion GW101 extreme winter impact glove, available at Working Person’s Store, can be your number one defense against hand injury. 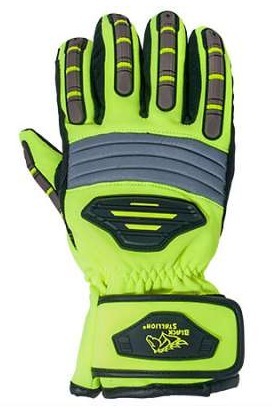 These high-visibility gloves have protective finger and knuckle guards on the back of the hand which have notches that allow maximum flexibility and dexterity. On the palm side, these gloves have synthetic leather reinforcements for added grip and strength. Black Stallion’s Gloves are designed with MultiBlend insulation for warmth as well as a waterproof lining. The outer spandex layer is hi-vis yellow, adding another element of safety to this already protective glove. Another great product that is perfect for winter wear use would be the Mechanix MCW-PP-CG Polar Pro Insulated Gloves. These insulated gloves are completely waterproof, and provide comforting insulation to keep your hands warm even in sub-zero temperatures. These Mechanix gloves are also great for labor purposes since they are designed with goatskin palms and reinforced goat skin fingers and thumb panels for durability and gripping ability. They also feature flexible TPR on the top of the hands and as knuckle protectors. 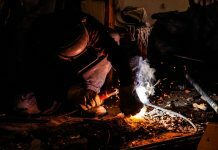 Finding the right kind of work equipment for the conditions you’ll be in is the right and smart route to take. If you do not think you can work easily in your current insulated gloves, then it’s time to rethink your workwear plan. Don’t ever sacrifice potential injury because your workwear doesn’t properly fit you. Watch for falling temperatures, be mindful of the hazards winter brings and make sure you keep your hands warm and protected! Layering seems like a basic idea when preparing for cold weather, but it is often overlooked. You need to be ready for the conditions you plan on working in. That is why it is always important to know what the environment is like and to always take proper precautions on staying warm in cold weather when you plan on working work participating in recreational activities in extreme winter conditions.